Airlines, airports, Best Meals, food, Italy, Restaurants - let's eat chic, Sardinia, Transport - planes, trains and automobiles, Travel - bon voyage! Picture the scene: it’s late morning at Sardinia’s Cagliari Elmas airport. Monsieur and I have been awake since dawn but haven’t had time for breakfast. The low-cost airline has high-cost sandwiches which we avoid, mostly because they already look curled and cardboardy, and the coffee looks like something that might spurt out of a long-disused farmhouse tap. Monsieur and I are not the types to eat for the sake of it so we wave the snacks trolley past. Besides, we figure that abstinence now will soon enough be rewarded when we lunch on some fine Italian food. As the aircraft doors opened to a rush of warm, Sardinian air, Monsieur and I were raring to go. That morning, we’d left the spring morning chill of Luton to fly into the deep blue hanging above this craggy isle. We decided to forget hotels for now; they’re for sleeping. Our feet had different priorities: they were itching to reach sand and saltwater. First, we picked up the hire car, which wasn’t the convertible Monsieur had booked – the previous renter had decided to abscond with it for an extra day and there weren’t any others available. We might have been miffed, but for two things: 1. only the most unreasonable of folk wouldn’t get the temptation to Just Stay One More Day – Sardinian weather in May is glorious; and 2. the alternative on offer was a brand new Fiat 500. Personally, I preferred it to the convertible; it had iconic value and would protect me from being flattened by wind and bugs as Monsieur zoomed along the autostrade. We sped away from the airport, past mud flats studded with the pale pink of flamingo, to the southern Sardinian coast. 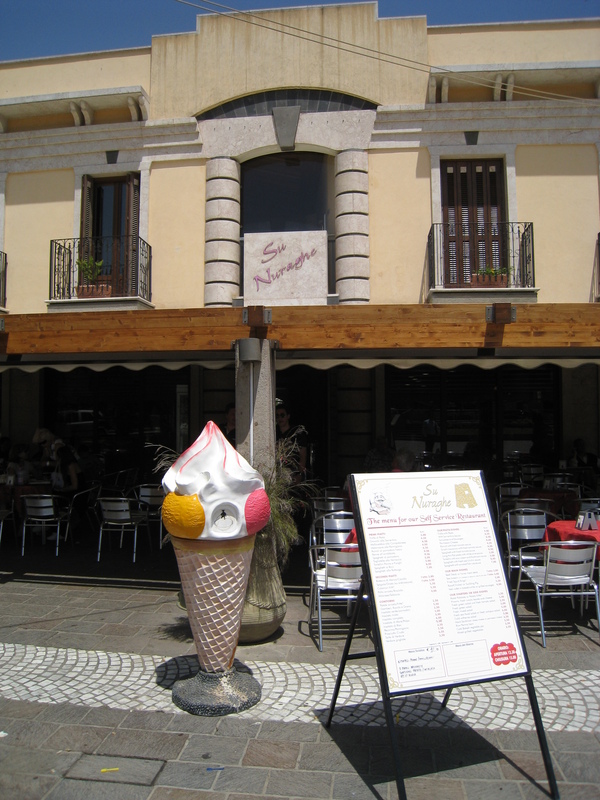 There, the road led us to a small town near the beach – formed of clusters of small, stuccoed buildings radiating out from a modern piazza. Everything testified to sensitive yet sensible town-planning, the shops and eateries all freshly painted in the sort of ice cream pastels that made me long for a gelato to drip down my hand. For that, however, I would have to wait a little longer. On opening the doors of our little ‘bambino’, the heat rushed at us like a blast from the oven. It was more than just warm – you could easily have fried a couple of eggs in less than a minute on the scorching asphalt street. Feeling the sting of the sun on our winter-bleached skin, we sought out somewhere shady to lunch, settling on a buffet restaurant called Su Nuraghe. The restaurant is named after the strange megalithic buildings (nuraghe) that look like stone beehives, marking the Sardinian landscape and now quite the unofficial symbol of Sardinia itself. We found a table in the shade, then ventured inside to order. The interior was cool and practical -sparkling laminate floor, glass and chrome counters, simple tables and chairs. There were no grubby fingernails here. We ordered lots of good, sparkling Sardinian water and plates of seafood salad to start. Mussels and crabsticks made an appearance in this simple dish, but fortunately for this lover of octopodes, there was a surfeit of eight-legged sea creature before me. 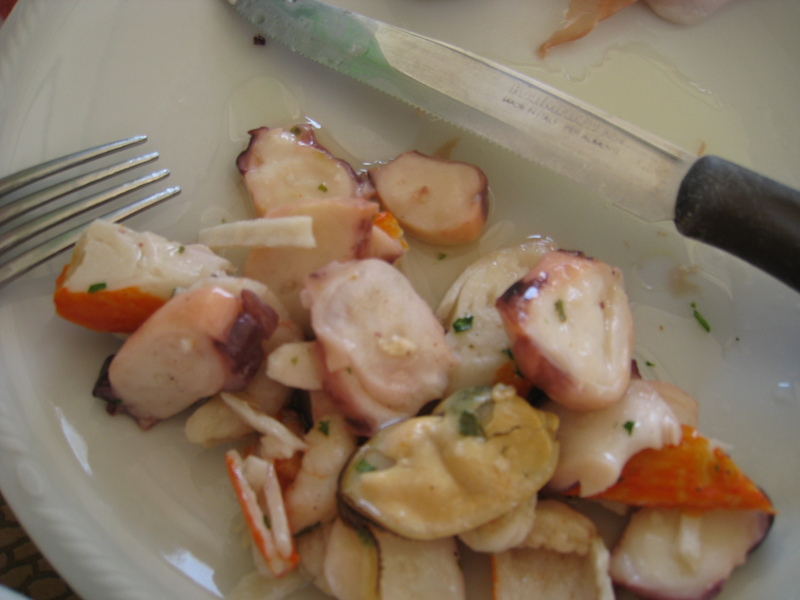 I do so relish the cool, fresh flesh of an octopus, served in the merest drizzle of olive oil and lemon juice. 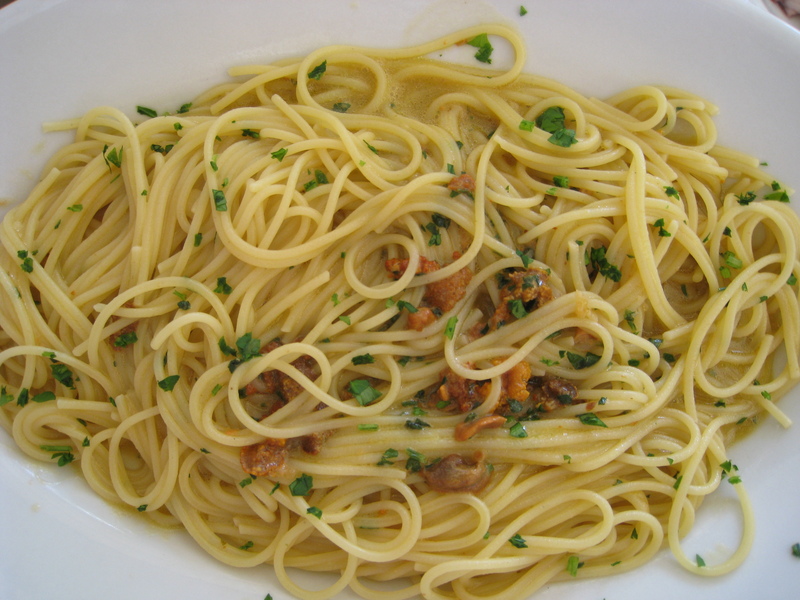 Next came plates of one of Italy’s simplest seaside pasta dishes – spaghetti tossed with olive oil and fresh sea urchin. The precious orange roe had a delightfully slippery texture and tasted like Neptune’s version of marshmallow – capturing all at once the taste of sea air on the tongue and combining it with a unique, briney sweetness. This was exactly the sort of food Monsieur and I had anticipated. Our morning’s patience had certainly been rewarded. Before heading off to the beach, we stopped at a gelateria for a refreshing treat. I was interested to note the existence of soya milk-based gelato on their menu, which is a boon for anyone with lactose intolerance! Tempted though I was to taste-test it, today I stuck to my favourite flavours: cocco, stracciatella e banana. I’ll never be size zero at this rate and, in this world of superficiality, I admit that such a thing doesn’t even approach making it onto my bucket list. Truth be told, I’m probably not the norm in this respect. I’d much rather meet my Maker with a stomachful of flavour and the memory of a good old slap-up lunch than arrive at the Pearly Gates regretting the fact that diet coke and a lettuce leaf (hold the dressing) had been my death row meal. As Fellini once put it: “Life is a combination of magic and pasta,” and if you could add the freshest seafood salad and quality gelato to that combination, you’d have a lunch that I’d be happy to enjoy as my last. It’s another evening of your post making me hungry! note: “We found a table in the shade, then ventured inside to order.” … I hate when people do that usually, but for you I’ll make an exception (and you’re nowhere around here). hee hee! PR – sorry, probably wasn’t clear. We had a table out in the shade, but there wasn’t waiter service, so we had to go inside to order our food at the counter. Funny, didn’t even think how that might sound odd. How’s tricks in The Land of the Rising Canuck? btw have you noticed that since I haven’t been blogging so often, you’re my one faithful comment maker? For that, my dear Planet, I thank you. I feel most privileged to know a Planet In Person. Almost as lucky as The Little Prince!